The Other 80 Percent: Turning Your Church's Spectators into Active Participants argues for seeing the marginally involved members of a church as a mission field. The book is a mix of original analysis of national research on attenders, many field studies and hundreds of interviews as well as reflections on cultural shifts related to volunteering and observed patterns from our studies of church leadership teams. 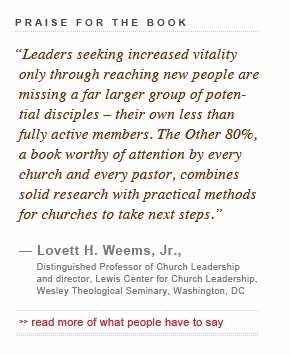 It offers a diversity of approaches for dealing with this 20/80 problem (20% of the people do 80% of the work while most of the rest do nothing) and various strategies by which a church's leadership might begin to address the issues of member mobilization and discipleship. The premise is that very few church leaders engage a large percentage of their membership in a life of faith that includes regular involvement in the congregation. 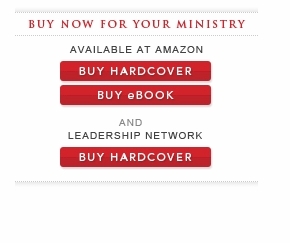 Thus, part of the reason for writing this book was to confront this too-often taken for granted reality that it is acceptable for a church to function with only a half of the members ever in attendance and only a quarter of those members significantly involving giving, serving, fellowshipping, attending, or inviting others. We offer a number of possible ways to lead a congregation past the 20/80 malaise. We suggest that leadership teams need to think critically evaluate what they are currently doing as a church to facilitate involvement. We further implore clergy, in desperate times like these for the future of the church, to think creatively and outside the usual approaches to reach the less involved. We suggest that there is no single solution, no one-size-fits-all answer, to this problem. But we do offer a number of possible approaches to addressing this issue from which they could pick and choose the most fitting for their context. So while we rely on surveys, field studies and interviews to arrive at our description of the issue and possible solutions, as a whole the book this essentially an action handbook to changing member involvement dynamics. First, taking an assessment of the opinions of members – listen to them (the highly involved and the least engaged) what motivated and hinders commitment in your congregation. Second, learn the patterns of involvement as well as the roadblocks and challenges in your community, in your church programs, and in the expectations of your staff and lay leaders. Third, identify those activities you are doing currently which promote and attract robust involvement and intentionally strengthen these to a greater degree. Fourth, think outside the box of ways of being the church, connecting members in ministry that fits their everyday lives and lifestyles, and that meets their needs, the church’s needs and the mandates of the gospel. Finally, remember that involvement and participation are the correlates of spiritual growth and a person’s spiritual fulfillment. 80% participation isn’t the goal – spiritual fervor and growth is. YouTube - What's the Big Idea of The Other 80 Percent? 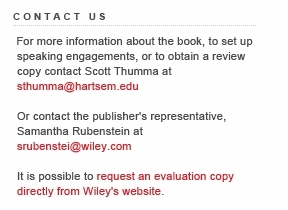 Co-authors Scott Thumma and Warren Bird respond to the question, "What is the big idea of The Other 80 Percent?" 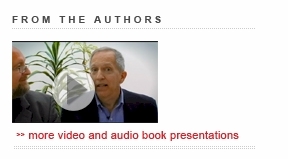 YouTube - The Other 80 Percent -Why did you write the book? Scott Thumma and Warren Bird discuss the question, "What prompted you to write The Other 80 Percent?" YouTube - The Other 80 Percent -What is the most challenging concept? Scott Thumma and Warren Bird address the question, "What is the most challenging concept of The Other 80 Percent?" Scott Thumma and Warren Bird discuss the question, "If leaders had time to read only one chapter of The Other 80 Percent..."
Scott Thumma and Warren Bird answer the question, "What is your favorite quote from The Other 80 Percent?" Place The Other 80%: Turning Your Church's Spectators into Active Participants at the top of your reading list. Employing fresh research, authors Scott Thumma and Warren Bird offer insights that will empower your work with your less active people. Pick it up today, read it tomorrow, and begin putting it into practice the next day.